SafeGuard Plug-In | Nexbridge Inc. 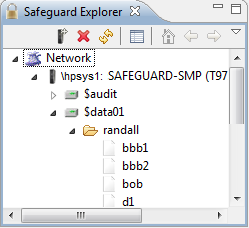 The Safeguard Monitor for ECLIPSE provides an integrated browser for security rules on all types of simple files on NonStop. Automatic ACL evaluation provides quick feedback on inherited Safeguard rules. Users will be able to quickly see where conflicting access rules are located. This plug-in leverages SSH and challenge-response technology to ensure that all monitoring is secure no matter where in the EXPAND network. EXPAND and IP network browsing. Node definition import/export for easy setup and definition sharing. RCP packaging available for stand-alone deployment.